"StarTech.com specializes in gadgets performing niche, yet handy functions. We reviewed their portable SATA duplicator last year, and this time around we have another interesting gadget from their stables. SATA and IDE hard drive docks / enclosures are a dime a dozen. 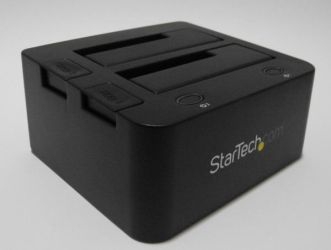 However, the combination of features provided by the StarTech.com USB 3.0 SATA/IDE HDD docking station persuaded us to get a unit in-house for evaluation." I know of more than one techie who has a closet full of hard drives. Salvaged from old computers, or as backups, or for archiving data, it is hard to beat the cost per gigabyte that hard drives offer. All that lovely data, but accessing it can be problematic. Docking bays are handy, however, having carts for them, or accessing your case may be convenient. There are USB to Sata adapters, but they pose some risks, leaving your hard drive open on a desk. The docking station solution, like the one StarTech offers, is a good compromise between archiving lots of hard drives, and accessing them when y ou need it. At USB 3.0 speeds, it looks very tempting.